In the early 20s of the 13th century, the South Caucasus and Asia Minor faced the invasion of the Mongols. 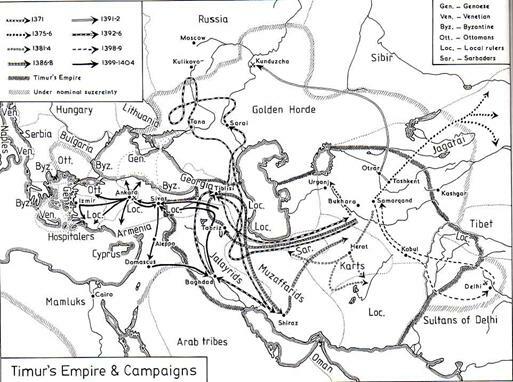 20 years later, in spite of the fierce resistance on behalf of the united Georgian-Armenian forces and their allies, the whole area including most of Georgia, all Armenian lands and Central Anatolia fell to the Mongols The Mongol rule was accompanied by devastation of the land, destruction, mass murder and extremely high tribute imposed on the population. Armed resistance and uprisings were put down with extreme cruelty. In 1243, Queen Rusudana of Georgia signed a peace treaty with the Mongols in accordance with which Georgia was losing all her client-states, ceded western Shirvan, Naxcivan and some other territories and agreed to pay tribute to the Mongols as well as to let them occupy and de-facto rule more than half of the remaining territory (see the map below). Although Mongol-occupied Tbilisi remained an official capital of the kingdom, the Queen refused to return there and stayed in Kutaisi until her death in 1245. In addition to all the above hardships, even the part of the kingdom that remained free of the Mongols started disintegrating: The Crown started losing control over the warlords of Samtskhe (southern provinces of Georgia) who established their own relations with the Mongols and by the year 1266 practically seceded from Georgia. 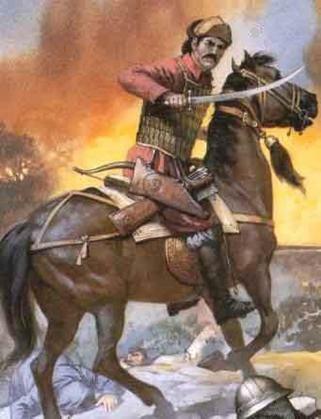 The period between 1259 and 1330 was marked by the struggle of the Georgians against the Mongol Ilkhan Empire for the full independence. The first anti-Mongol uprising started in 1259 under the leadership of King David Narine who in fact waged his war for almost thirty years. 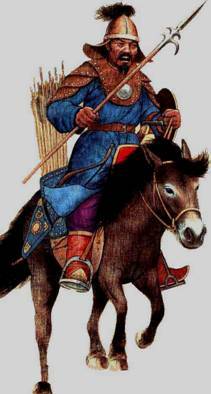 The Anti-Mongol strife went on under the Kings Demeter II (1270 - 1289) and David VIII (1293 - 1311). Together with the rest of western Georgia, Abkhazia was one of the main bastions of Anti-Mongol resistance. Finally, it was King George V the Magnificent (1314 - 1346) who managed to play on the decline of the Ilkhan Empire, stopped paying tribute to the Mongols, restored the pre-1220 state borders of Georgia and even returned the Empire of Trebizond into Georgia’s sphere of influence. 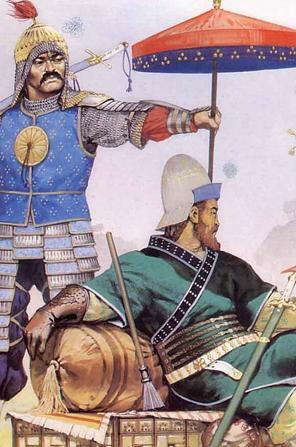 The year of 1337 saw the collapse of the whole “Pax Mongolica” in the Middle East. 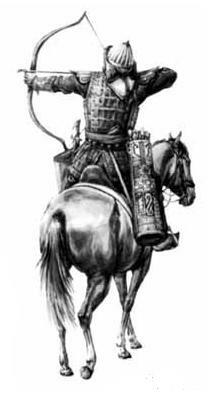 However, the Mongols were succeeded by various Turkic invaders. In 1386-1403 the Kingdom of Georgia faced eight Turco-Mongolic invasions under the leadership of Tamerlane that probably happened to be the most destructive cataclysm in the whole history of the nation. All over Georgia except Abkhazia and Svanetia, the cities and towns fell in ruins, tens thousands were brutally slaughtered and even more enslaved and deported. The country was devastated and sliding into anarchy. Once again, Abkhazoia remained one of the last enclaves of Georgian statehood. The death of Tamerlane in 1405 resulted in almost immediate fall of his empire. After that, Ottoman Turks, Egyptian Mamlyuks and other Turcic tribes became dominant powers in the Middle East / East Mediterranean area turning the area into Turco-Arabic realm. It was during the 15th century when the whole area changed dramatically in all possible aspects: linguistic, cultural, political, etc. During that period the Kingdom of Georgia turned into an isolated, fractured Christian enclave, a relic of the faded East Roman epoch surrounded by Muslim, predominantly Turco-Iranian-Arabic world. By the middle of the 15th century, most of Georgia’s old neighbor-states disappeared from the map within less than a hundred years. 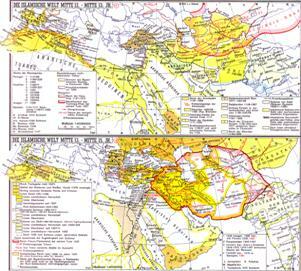 All of Armenia for example, fell under the Turcic tribes of Aq-Qoyunloo, Kara-Qoyunloo and Ertena, diminished Armenian Kingdom of Cilicia fell to the Mamlyuks and only several tiny principalities in the mountains of Karabakh preserved certain autonomy as a reminder of once mighty Armenian statehood. East Roman (Byzantine) Empire lost all her possessions and compressed itself to several isolated feeble enclaves the most important of them being Constantinople and Philadelphia (in the heart of Anatolia). The Empire of Trebizond was also rapidly diminishing losing territories and any political will for survival. West European Crusaders completely lost the 350 years-long battle for Palestine and Syria and were forced to evacuate all their possessions except Cyprus and other Mediterranean islands. 1462 was the year of the fall of Trebizond. Naturally protected by the high mountain ranges, boasting many fortresses and castles the Empire of Trebizond could withstand for a long time. In spite of that , the country lost all political will for resistance and the last Emperor surrendered to the expanding Ottoman Turkey practically without fight. In 1475, the Crimean peninsula also fell to the hands of Ottoman Turks and Tatars. The Moslem conquest of the Crimea resulted in rapid Islamization of Adygh and Vainakh tribes in North Caucasia, the area where for a long time Islam had to compete with Orthodox Christianity, Roman Catholicism and Paganism. Since that moment Georgia found herself completely surrounded by the Muslim world. The last remaining hope for clearing communication routes with Europe could still be connected with the Republic of Venice that waged naval operations against the Turks in the Aegean Sea as well as with the Papal cal for the new crusade. However, the geographical discoveries of the last decade of the 15th century (discovery of America and the sea way to India around Cape Horn) re-directed both economic and political interests of major European powers from East Mediterranean area making it political backwater of the West. 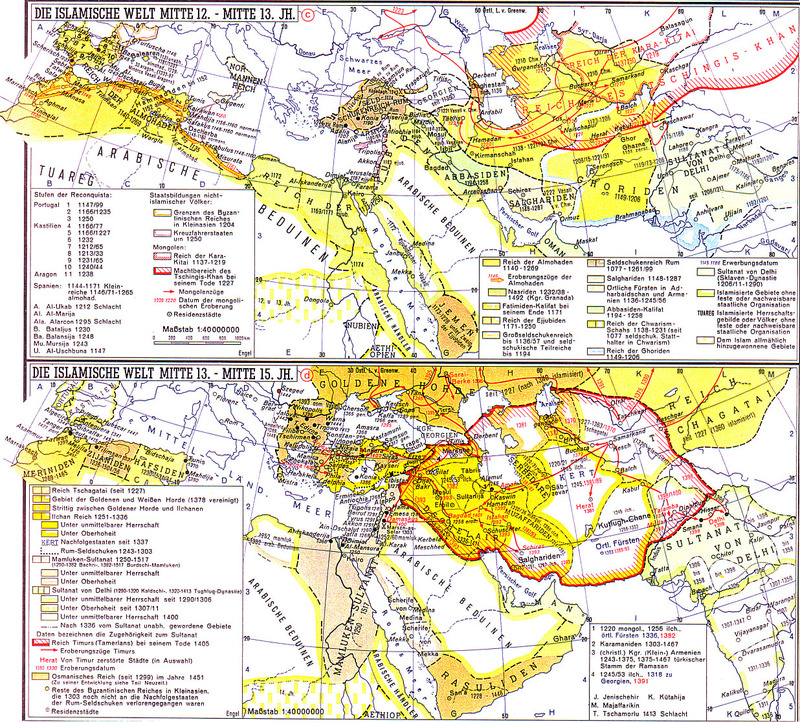 Drastic decrease of interest towards the Silk Road was accompanied by totally fading interest towards Georgia, the last, weakening Christian bastion in the Middle East doomed to the absorption by the rising Muslim powers. In order to withstand external pressure Georgia desperately needed unity and consolidation. Instead, the country was falling apart. Several pretenders to the throne put various parts of the country under their control, waged wars against each other often doing so at the expense of the country’s security and seeking support from the aggressive neighbors. In 1490 the Royal Council (Darbazi) officially recognized the breakup of Georgia into the three Kingdoms of Kakheti, Imereti and Kartli and the Duchy (Saatabago) of Samtskhe. 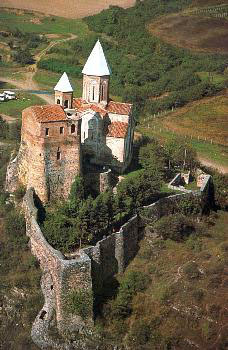 According to the declaration of 1490, Abkhazia was to stay within the Kingdom of Imereti.